I enjoy working with people to create software. For that purpose I founded Indoqa - a team of enthusiastic software engineers. I'm also the co-founder of DEEPSEARCH which is specialized in intelligent search solutions. Both companies are located in Vienna (Austria) and we have been working on projects across Europe. This blog covers software engineering, the productivity of software developers and topics related to search-based applications. Easier configuration using the Spring Configurator. There is no need for patching XML configuration files. Here is my presentation as a PDF. The relaunch of cocoon.apache.org went online. Check it out! the Cocoon Servlet-Service framework which introduces contracts between sub web applications. Both can be easily used without Cocoon Core. 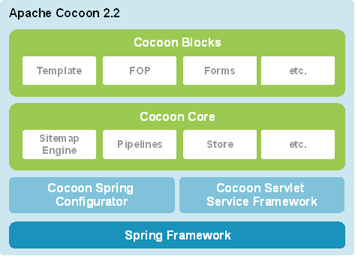 Cocoon Core has been put on top of those two frameworks and “only” provides pipelines, sitemaps, out-of-the-box caching support and the most important sitemap components. Everything that goes beyond that has been moved into its own block. Also custom Cocoon applications are build as blocks. a container for classes and resources (e.g. sitemaps, templates, images, etc.). A block is packaged as a Java archive (jar) following certain conventions concerning the directory structure. So adding a block to your Cocoon application only means adding it as a dependency and all the services (see above), Java classes and recourses become available automatically. Are you curious? There are a bunch of tutorials that help you to get started! I’ve been involved with the Apache Cocoon project for more than 5 years. In 2003 I was voted in as Committer and recently I was elected as the new Cocoon PMC Chair (Project Management Committee). At the end of the last year I also became Apache Member. That’s a development I would have never dreamed of and I’m really happy that so many people trust in me. Thank you very much!